Steve McIntyre has a new post on a new paper by Raymond Bradley that supports a longstanding Climate Audit criticism of varve proxies. Is withholding your data merely bad science, or should it fall under misconduct? [link] Check out the comments, also. I’d like to know the fields of the 40 academics behind the statement, “Almost every academic knows that public engagement damages your career.” Climate-related fields seem to prize and prioritize public engagement/communication over the substance of their research. within the overall cold phase of the PDO , which has occurred many times in the past as the data in the above verifies. This El Nino /spike in PDO is not going to have any world implications when it comes to the climate. They are both intrinsic earth climatic entities which cause the fluctuations to occur within a given climate regime and nothing more. The big picture since the Holocene Optimum remains intact which is a gradual cooling with spikes of warmth within the overall cooling trend. AGW theory not conforming to the data in any manner. The spike happened when there was no El Nino. In fact, the conditions were leaning toward La Nina. Lots of negative ONI. I believe captndallas pointed out the something similar happened in the pacific in the 50s. The recent “OMG!” warm pacific sea surface temperatures were barely different from then, iirc. what about from the 1940’s and before? What about it? The PDO-ENSO covers a vast area of the earth. When it changes trend, the Global Mean Surface Temperature usually changes trend. Are you implying that the trend is only your friend until the bend shows the end of the trend, friend? I’ll be blowed! Who’d a thunk it? Look again. It did not change direction. The AMO went with it, and it has just about everybody completely bamboozled. If you weren’t so busy being the smartest person on the planet, you might have noticed. I see. So when the trend changed, and the other trend also changed, neither really changed direction. This must be another Warmist redefinition where “changes trend” really means “doesn’t change trend at all. It just looks like it does, to bamboozle everyone not in on the trick”. I only look smart in comparison to the average Warmist who hasn’t woken up to the fact that Nature doesn’t seem to cooperating with the Warmist models. Dumb and dumber, maybe. You tell me! It would look more impressive if you started in 2011 instead of 2013.41. Do you find it ironic that you keep hoping for natural variability to start it warming again? PDO and ENSO and so on. I do. No, what I look for is any sign natural variability can cool the earth, and there is no sign at all that it can still do that. It was not very long ago that it could. The climate models have incomplete, and inaccurate data, so do not expect an accurate result. I believe this is the third paper on geothermal activity in the west antarctic peninsula during the last year. Keep digging. I know the answers are there somewhere. Tamino is a stand up guy for owning up to his error. Refreshing. I think Tamino deserves credit for admitting to his mistakes. I have left a note of appreciation on his blog. I did too. What should be standard operating procedure is all too rare. There are 300 Billion stars in our galaxy. Can we document that this exact phenomenon of “double dynamos” has or is happening in other stars in our neighborhood? Surely there are hundreds of stars that are transitioning between these weak and strong phases since we began high resolution star observations. Unlike our current global experiment of chemically modifying the biosphere (on the only known planet in the universe that actually has biological activity) at least there should be clear evidence of this Most astrophysicist agree there is a strong correlation of climate change and the Maunder Minimum so this is very interesting. Well… the nearest star is 272000 times as far away as the sun. Perhaps counting sun spots on distant stars may be a bit more challenging than keeping track of the sun. It’s based on models anyway so we can ignore it. jack – we can see it in the data, not just models. At any rate, while it is an interesting scientific question how other stars behave, those won’t affect our climate, generally speaking. Although I’m aware there is some speculation that our position relative to the galactic arms might affect climate. However, the existence of the “double dynamo” in other star most probably won’t matter to our climate. The solar model is claimed to be 97% accurate. The GCM models aren’t accurate and don’t correlate well with the raw data. A model that emulates the underlying system well – like the solar model – is a useful tool. Perhaps you are too familiar with GCMs – real models are supposed to emulate the underlying system accurately. My reason in pointing out we need to study other variable stars was to get a better estimate of how deep/strong and long/short these cycles last just so we might be able to put some upper and lower bounds on what to expect for our sun. If this model is accurate (you claim 97%) then would it be a safe bet that the industrial world will need to ramp up fossil fuel consumption by a significant amount to compensate for the extreme cold. Does it then logically follow that our current estimates of coal/oil/gas reserves will need to be scaled back too. As to GCM perhaps the best indicators will turn out to be the biosphere itself. Before we discovered a way to measure methane gas in coal mines we used birds (the canary in the coal mine) to determine when it became too dangerous for humans so maybe we will have to monitor the life forms at the bottom of the food chain to know when we have pushed things too far. The Keck has a 0.04-0.4 arcsecond resolution. The sun at one light year is 0.03 arcseconds in diameter. This makes studying the solar cycles of other stars a little challenging. Apparently some of the emission lines are related to the magnetic field so they have tried to study similar stars. There is some thought that the gas giants influence the solar cycle. The barycenter of the solar system is outside the sun 64% of the time. Not much to worry about with your “experiment”. 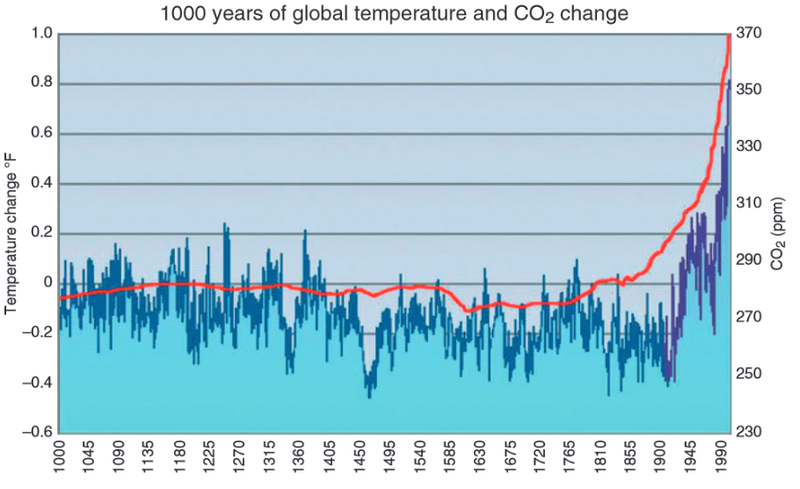 CO2 levels have been far higher in the past, and the Earth still managed to cool, didn’t it? CO2 (and H2O, the other main product of burning hydrocarbons) are both pure organic compounds. Re greening the Earth will require lots of both, although California is crying out for more H2O. How do you know that cutting back on fossil fuel consumption didn’t cause a drought in California? I suppose you’ve got a model that proves that increased moisture and plant growth is evil. The Pope thinks so, so it must be true. Let them eat sand! So typical of you to read what you want to believe in to everything. If CO2 was the only thing we have to worry about then I might agree with you but to ignore the gigatons of all the other effluents pumped in to the biosphere because of unrestrained industrial production is why I can’t take you seriously. Hang on a sec. I thought you were talking about climate. If you want to perform the Warmist technique of the lateral arabesque, changing the subject in midstream, be my guest. I agree that asbestos dust from brake linings (allowed by the EPA), lead in aviation fuel (allowed by the EPA), and so on, is probably unsafe. By comparison, CO2 and H2O are paragons of organic Nature at her finest! I’m not sure what the effects of asbestos, lead or mercury, are, as far as climate goes. Neither are you. If you are expressing moral outrage about atmospheric pollutants, why don’t you concentrate on the nasty, rather than the nice? Would you rather your children consume asbestos, lead and mercury, or water? I know that’s a rhetorical question, but Warmists seem a bit slow, on occasion. So what’s your answer? Sorry, this reply got de-linked from my original comment about studying other stars to define the bounds of what a extreme solar minimum might do to our solar output. But back to the issue at hand. All I am saying is when we focus myopically on just CO2 we are willfully ignoring the tens of thousands of other compounds we have generated in mass quantities and dispersed in to the environment. Take one example, the EPA recently approved a new type of herbicide (Enlist Duo) that blends Glyphosate with 2,4-D (AKA Agent Orange) because the current formula has led to a new type of super weed. *Super weeds are just regular weeds that have adapted to high concentrations herbicides and could be at Achilles heel of industrial monoculture. But wait there’s more! Take a look into the wonder molecular compound called “micro fibers”. We produce millions of tons of the stuff, it has a half life of decades and can infiltrate almost every know life form because it’s so tiny (nano particle size). There have been literally hundreds of thousands of new compounds introduced into the biosphere in the last 20-30 years and so I stand by my claim that we are conducting an uncontrolled experiment on the planet. I was especially interested in the ‘medievalist’ link until I read through it and discovered that once again it relates to tree rings. Although I have looked at them in great detail I still don’t get why they are seen as an accurate thermometer. Using them as summer time only temperature reconstructions seems to rather diminish the overall work as summer is only one of the four seasons so the conclusions they come to are doubly flawed in using just one season AND using tree rings. Using the top 40 volcanoes to correlate with temperatures also seems dubious, as whilst there is evidence that the biggest and dirtiest eruptions might have an effect for a few seasons, by the time you get outside the top 5 or 10 the effects look to be rather minimal. The difficulty in using novel proxies is highlighted in the Steve McIntyre piece in which the use of varves in temperature reconstructions is questioned. Its pretty simple.. You calibrate them to a known record. Their accuracy is conditional upon the calibration and your assumptions. Any estimate that is based on questionable assumptions is by definition inaccurate. Estimate implies inaccuracy. If I say that I estimate the number of people in a crowd at ten thousand I am saying that I do not know the actual number. We know that tree rings are not accurate thermometers, nor can they be, because their featuers are caused by many factors besides temperature. No assumptions can change these biological facts. So people who use tree rings as though they were accurate are making a known error. Treating crude estimates as accurate measurements is the leading fallacy in climate science. All assumptions are questionable. that is why they are called assumptions. The can all be questioned. So, for example I assume that physical laws will remain unchanged. I assume that instruments to not move in and out of calibration while I am using them. With tree rings the assumption is simple. The same relationship that holds inside calibration holds outside calibration. This assumption can be questioned. its questionable. BUT, you can also test that by having a verification period. There is no science no measurement no THOUGHT without assumptions. When Galileo first estimated the speed of light he used a crude estimate. Throughout history crude estimates lead to better estimates. Treee rings have pros and cons. Its logical and rational to extract what information you can out of them. Then test that information. dogmatically rejecting information is not the path to better understanding. Problem 4 the are greatly affected by weather. Prblem 5 they are enomously affected by microclimates, shading, competition etc. Btw I agree with your comment that we need to start planning for the future climate by looking at that of the past. The climate over the last fifty years or more has been relatively benign and we have been lulled into believing that is normal. 1. You are not a policy maker. 2. Policy makers get to decide the WEIGHT they assign to evidence. 3. Policy doesnt NEED any information from Paleo. a) C02 will warm the planet, not cool it. b) dumping C02 into the air with impunity is Not risk free. c) charting a path to carbon free energy sources is a good idea. The typical thing you find with skeptics is that they tend to reject efforts to glean all the information one can from all availble sources. They tend to pick a source that accords with their understanding or skills and then they discount to ZERO all other sources. For example.. Take SST before 1950. Clearly one would like better data, but real scientists work with what they have. Wrong. If only physics is needed why is so much time and effort expanded in paleo proxy reconstructions in establishing the past climate. It’s because policy makers wouldn’t accept something proven in equations or the laboratory. Why would anyone want to use sst’s prior to 1950? . The first scientific examination was the challenger in 1876 . It coverd a tiny fraction of a tiny amount of sea. Most of the oceans were noT travelled let alone measured in any meaningful manner for decades after that. c. When did you start to decide what is and isn’t “good”? Is warming “good”? extra rainfall? more CO2 plant food? b. taking all information into account, dumping CO2 into the air is probably beneficial. a. how much, and wouldn’t that be good overall? Extra CO2 will increase the cooling rates of the upper troposphere and stratosphere, where radiation is the only cooling mechanism. “Raw” physics has never been adequate for policy. Refinements are necessary. Whenever you write about physics you exclude the non-radiative transfer of energy from the Earth surface. Also needed are the comparisons of costs to benefits. Gotta think that Mosher is smarter than he’s letting on. He knows that not all proxy data is equal, that some tree ring data may be useful but a person might wonder “what do we not know about the history of these trees?”. If there are other proxy types readily available, with fewer questions, how should one’s research time be spent? The real “raw physics” in the 50 page technical description of the 1976 US Standard Atmosphere (the essentially identical in the International Standard Atmosphere) does not use one single radiative transfer equation or calculation. SB Law is not even listed in the table of all equations used. Further, they calculated the effect of all 0.40% CO2 upon atmospheric temperatures from the surface to 100km, found it to be negligible, thus decided to completely eliminate CO2 from their 1D mathematical model of the atmosphere. Are you a denier of the raw physics of convection, gravity, atmospheric mass/pressure/density/kinematic viscosity/adiabatic processes as proven by Std Atm? And that the US Std atmosphere mathematically calculated the 33C GHE as well as the even larger negative 35C anti-greenhouse effect, without ever once using CO2 or one single radiative transfer calculation? Why do you think that is? Are you a denier of the raw physics/quantum theory that the maximum possible emitting temperature of CO2 15 micron line-emission is 193K, which is 62K colder than the ERL, and 95K colder than the surface? Are you a denier of the raw physics of 2nd Law, which says HEAT cannot be transferred from a 193K body to any body warmer than 193K? Are you a denier that in the troposphere CO2 primarily transfers HEAT by collisions with N2/O2, which thereby accelerates convection to cool the planet? Not “dumping” trace CO2 plant food into the air risks the 30% greening of the planet over the past couple decades due to CO2 fertilization. Weeds are plants. The reaction of many populations (e.g. “species”) to changes in a primary nutrient availability is often non-linear, and frequently mediated by micro-evolutionary processes that take a number of generations to reach full effect. Therefor, adding “trace CO2 plant food into the air” includes the risk that new weeds will appear, suddenly and unexpectedly competing with our crops for the now more limiting water, soil, and sunlight. “3. Policy doesnt NEED any information from Paleo. Policy needs to know uncertainty and consequences to assess risk (typically [consequences X likelihood]). I’d add that in the end in the better democracies these issues aren’t determined by policy makers, they are determined by (hopefully) informed political processes. If the great unwashed don’t like Paleo then so be it. “Wrong. If only physics is needed why is so much time and effort expanded in paleo proxy reconstructions in establishing the past climate. It’s because policy makers wouldn’t accept something proven in equations or the laboratory. b) it offer the Hope of REFINING understanding. c) some people wrongly assume its a nail in the coffin type of evidence. 3. There is No evidence that Policy makers demand paleo. You only need physics. Showing that people go beyond this need, illustrates nothing. Mosher, for someone who is so quick to say “wrong” to others, you need to be more precise in what you say. This is true if and only if ALL OTHER THINGS ARE HELD EQUAL, which they NEVER are nor NEVER can be. Given that all other things can never be held equal, your statement is unequivocally incorrect. Frost rings in the trees are a reliable marker. I would suggest that attitude is the primary source of frustration for those who seek to develop and implement climate-related policies. Perhaps the “Policy” being referenced is a platonic ideal without hope (or care) that it be adopted. Nevertheless, it displays a profound misunderstanding of what actually goes into making sound public policy. The biggest problem with tree ring proxies is the bias that occurs when explicitly or implicitly selection of proxies occurs after measuring the correlation of the proxy response to the instrumental temperature record. Why those doing temperature reconstructions do not properly develop a proxy selection criteria based on a reasonable understanding the physics involved and then use all the selected proxy results is a puzzle – unless such a process would not produce proxies that would consistently and quanitatively respond to temperature. We know that tree rings respond to climate variables other than temperature. Even using all the selected results in hopes of the other variables cancelling out will not produce a proper response if those other variable responses are not mostly random. Here, let me fix that. The typical thing you find with warmists is that they tend to find information in sources that fit their narrative without any thought as to whether that information is possibly valid. Tree rings come to mind. “Treee rings have pros and cons. Its logical and rational to extract what information you can out of them. Then test that information”. so Mosh…enlighten us…just what information do you think is reasonable and logical to extract from tree ring time series? I looked to see what you’ve published on the subject… you know, in peer reviewed journals, the place where the results of the hard work of science are shown, I believe that you know this. The funny thing is, I haven’t been able to find a single article with your name attached-either as a lead author, or otherwise…help us all out? I have no idea of the nature of the publication in which they appeared or how much each paper was subsequently cited.. Which ASSUMES your knowledge and understanding of of physics are 100% complete. Which of course they aren’t. It appears you are mixing accuracy and precision. If you estimate a crowd at 10,000 people and the actual number is between say 8 & 12 thousand, your estimate is fairly accurate if all you wanted to do is get a rough head count. It isn’t precise, but it will do. If you estimate 10,000 and the number is more like 5,000 or 20,000, then your estimate is neither accurate or precise. If the objective of the measurement is tied to a more specific outcome – say you get paid $1 for every perdon in the crowd, then you want to be precise and estimating the crowd by the area they occupy may not suit your purpose. I personally think that some researchers attribute to tree rings a degree of preciseness that is simply not there. Like saying I can determine that 11,847 people were in the crowd last week. Now pay me my money. You are missing the math. Trees are found on about 30% of the surface, have about a 30% correlation with land temperature and the 30% of the surface where trees are found has about a 12% correlation with the majority of the world oceans prior to 1990.
trees are obviously better than no thermometer at all and we need to know those regions and times when we have little or no data to determine that coal is a demon of biblical proportions which tends to verify previous studies that indicate hell does exist, in order to get Papal blessing. Coal related PM2.5 also tends to reduce the body mass of witches which should cause them to be more likely to float. It is data tonyb, it deserves respect. was cited 12 (twelve) times according to google scholar…..
Its interesting that this body of work entitles one to opine and castigate others…while a guy like Lindzen, with hundreds of papers, and tens of thousands of cites, is pilloried as senile and a paid shill. McIntyre’s post is particularly damning of consensus paleoclimate reconstructions including PAGES2K. They sweep their mistakes under the rug while building them into subsequent work. I remain ambivalent about sun spots but they would seem a better match on the whole than volcanoes. Climatereason , when you apply ALL of the natural factors to climate variability you get a pretty strong correlation. Sunspot activity and major volcanic activity correlate strongly which is one of my solar secondary effects. Climatereason, there were SIX major volcanic eruptions between 1650-1700. The VEI index is logarithmic AND has some severe limitations. “A total of 47 eruptions of VEI 8 magnitude or above, ranging in age from Ordovician to Pleistocene, have been identified, of which 42 occurred in the past 36 million years. The most recent is Lake Taupo’s Oruanui eruption, 26,500 years ago, which means that there have not been any Holocene (within the last 10,000 years) eruptions with a VEI of 8. There have been at least five identified Holocene eruptions with a VEI of 7. There are also 58 plinian eruptions, and 13 caldera-forming eruptions, of large, but unknown magnitudes. There are likely many other eruptions that are not identified. Under the VEI, ash, lava, lava bombs and ignimbrite are all treated alike. Density and vesicularity (gas bubbling) of the volcanic products in question is not taken into account. In contrast, the DRE (dense-rock equivalent) is sometimes calculated to give the actual amount of magma erupted. Another weakness of the VEI is that it does not take into account the power output of an eruption, which makes it extremely difficult to determine with prehistoric or unobserved eruptions. So not all volcanic eruptions are of equal importance nor have the same effect. Some of the volcanoes quoted in the study would likely have had a very limited impact on temperature, although of course their location and time of year would have an impact. I agree that ALL natural impacts added together may have a very significant impact. Changes in the oceanic circulation/ ocean temperatures/ volcanoes/sunspots etc etc taken together is likely going to have a serious impact on climate. Where they occur separately and not as one concerted impact the effect is likely to be substantially smaller. Tony, my essay Blowing Smoke went into the details as to why you found what you found. Volcanos come in two basic types, basaltic (think lava) and andesic (think ash). Only the ‘ash’ type has the ability to inject aerosols into the stratosphere were they can linger. Else washed out in weeks. Only some VEI >=4 have enough energy todo that. St. Helens was an ash VEI5, but still nothing reached the stratosphere. Mt. Saint Helens only an explosive index of 4. SdP, just checked MSH. USGS says was VEI 5. For what it’s worth I couldn’t work out what the Okataina eruption in NZ was. It is more commonly referred to here as Mount Tarawera, and I had thought Lake Okataina was just part of what remains. But looking at the background resources (www.gns.cri.nz/Home/Learning/Science-Topics/Volcanoes/New-Zealand-Volcanoes) I see Tarawera is just part of the wider Okataina Volcanic Centre. The site notes “This area is a caldera (collapse crater) that became volcanically active about 400,000 years ago and which last subsided about 64,000 years ago. Since then eruptions from many vents in the caldera floor have built dome volcanoes and partly filled in the hole left by that collapse.” Tarawera is one of the latter. Just a whimsical aside about what one learns about one’s country reading a blog on a fine Sunday winter’s morning. It may well not survive the moderators’ steely gaze. Are CMIP5 Models UNpredictable? And INsignificant? variable doubles the total error. We show the effect in probability (via copulas) and payoff space (via sums of r.v.). Higher dimensional systems –if unconstrained – become eventually totally unpredictable in the presence of the slightest error in measurement regardless of the probability distribution of the individual components. List of requested variables and standard output in the CMIP5 Global Climate Models runs to 133 pages! Do the CMIP5 global climate models have sufficiently “higher dimensionality” as to be “totally unpredictable”? John Christy’s testimony to the House May 13, 2015 shows the mean of 102 CMIP5 model predictions for mid tropospheric tropical temperatures running ~500% hotter than actual temperatures since 1979! How great does the divergence between climate models and reality have to be before we say they are “wrong”? “Modifications of common standards of evidence are proposed to reduce the rate of nonreproducibility of scientific research by a factor of 5 or greater.” . . .that recent concerns over the lack of reproducibility of scientific studies can be attributed largely to the conduct of significance tests at unjustifiably high levels of significance. To correct this problem, evidence thresholds required for the declaration of a significant finding should be increased to 25–50:1, and to 100–200:1 for the declaration of a highly significant finding. In terms of classical hypothesis tests, these evidence standards mandate the conduct of tests at the 0.005 or 0.001 level of significance. When more than 99% of model predictions EXCLUDE the observational trend evidence, can we conclude that the CMIP5 models are have the LOWEST degree of significance? i.e. are global climate models now “INsignificant” for public policy? Or are they now highly INsignificant? Both positive (rejection of null hypotheses) and negative (inability to reject null hypotheses) findings have the potential to reduce uncertainty and to inform best practice. Can we now benefit from “negative thinking” by concluding that CMIP5 models CANNOT reject the null hypothesis that climate is driven by natural variations? Not a problem. The temperature Regulation of Earth is very Robust. Many things can push temperature around, but nothing has pushed temperature out of the same bounds for ten thousand years. Golly. Where have we heard that before? Is it new among the climate activists? Good examples include London’s flood-defence system (the Thames Barrier) and the Delta works in the Netherlands — a large flood-protection system that shelters the Dutch coastline. Flood protection! What next, irrigation? Just to be clear, those were not my words – they were from the article. All the carbon mitigation strategies proposed by those alarmed by CAGW are just ineffective self-inflicted economic wounds. Money allocated to flood protection, land use planning, urban planning, erosion control, clean water, sewage treatment, etc would be well spent. Yeh, I got that. I hope I did not imply otherwise. That is why you start by adapting to the weather of the past. This is the path. Take it. That is what I have been writing, with specific recommendations about flood control, irrigation, and reforestation; giving as examples California, the Indus Valley, and New Orleans. What a disrespect for global warming models. And for a climate money machine. At the start of Day 5 I was going to do a spoof Test Match report using climate science type adjustments. Unfortunately Australia didn’t make it to Day 5…. Better luck next time. Naw, I don’t mean that. Was that a traditional English wicket you had us playing on? Or was it a traditional English pudding? We should have checked it for threepences after the match. moso, it was a Welsh wicket, and it was the same for each side. You might have to find another excuse after Lords. I was getting worried about your non reaction. As was said, it was a welsh wicket that reflects their damp climate. Same for both sides. It made for a good batting wicket with a lot of runs scored at a high rate and many wickets taken. To take advantage you need good batsmen and good bowlers. You have both so I am sure that however the next wicket plays the Aussies will bounce back. Latest on Greece from the Belgium minister seeking a solution. In effect, ‘We need more Europe not less’. My wife and I burst out laughing. What planet do politicians live on? I will put up the theory I presented against AGW theory any day of the week. The water/ transpiration study uses an interesting methodology, the relative ratios of deuterium water in different water cycle pathways. But it is hard to think the overall global conclusion can be robust, or even meaningful. There are too many ecosystems and soil types (sandy, loamy, clayey). There is little transpiration in higher latitudes in winter. Spring snowmelt produces a lot of runoff (surface water pathway to oceans; in those same regions, summer showers won’t. I think about the way the Wisconsin River changes seasonally near my farm. They had global data, but did not apparently break things down by region or season. I was thinking the same thing, but I guess they have to start somewhere. In my neck of the woods, much information about soil erosion was published after a catastrophic landslide killed many people more than thirty years ago. One of the recommendations was to seed new slide cuts with a special mix of grasses. It was then discovered that this strategy, while it reduced surface erosion from raindrop impacts, actually reduced the rate of evaporation at the surface of the soil. As a result, saturated hillsides retained water, which is a bad thing. The killer slides occur because of deep movement of the soil, as I understand it. Anyway, it’s good to do these kinds of studies. “In fact errors are so convex that the contribution of a single additional variable could increase the total error more than the previous one. The nth variable brings more errors than the combined previous n-1 variables! That is a problem for climate models. Here are the most ignored climatic factors. There are of course many more but these three in particular stand out. The models have no CONCEPT of any of these and they are going to predict???? There is electrical, magnetic, gravitational, neutrino, etc. coupling between the earth and the sun and we haven’t started to mention cosmic rays and solar wind yet. And any or all of these may affect weather patterns or climate cycles. The sun positively charged and the earth is negatively charged. The sun magnetic field at earth orbit is 10-9 tesla. The sun is about 900,000 miles across and we are only about 100 times that far away from it. The earth is awful close to its primary. The assumption is that virtually all the energy transfer is by radiation. A solar flare can have 60 yottajoules of energy (1/6 of the suns instantaneous output). The amount of energy the earth receives from the sun is only 174 petawatts. The core of the earth is about twice as hot as the sun and 5-10% of that energy comes from gravitational force (as an aside the core is actually expanding as it solidifies and that is heating the mantle as well). Lots of things going on. Don’t believe the situation has been studied in sufficient detail. The “all energy incoming/outgoing is by radiation” meme is convenient but might not be as accurate as believed. Without accurate information on the energy exchanged from other interactions and the trends it is hard to say how significant they are. Can I add one or two? Three dimensional chaotic movement of the crust, and probably mantle. Unknown, but probably chaotic temporal and spatial redistribution of energy within the core. Unknown, but probably chaotic energy production by mass conversion within the core. That’s about enough to justify outbreaks of depression and sobbing amongst climatologists, all by itself. Climatereason– your reply to volcanic eruptions does not make sense since all of the eruptions I used are greater then some of the ones you included in your data such as Mt. Saint Helens. Sardeshmukh’s analysis was for a period where the mean only shifted by 5-10% of a standard deviation, and perhaps subtle changes in the distribution regionally can change extremes, especially when looking at DJF which has a higher standard deviation than the northern summer. In the northern summer the mean has shifted by a standard deviation since 1950 in most continental areas, and it is possible for it to shift by at least 2 more standard deviations by 2100. So then it won’t matter what the tails do, the 1950 2-sigma hot summer becomes the mean, and their probabilities increase sharply. So, Sardeshmukh’s work does not relate to possible futures because the shifts are an order of magnitude larger. Not only does CO2 reduce water stress, warming should bring more water to land and this article suggest that the water stays (excepts I don’t think they addressed where the evaporation goes). I think with warming and increasing GHG concentrations, we can expect excellerated greening. I think biological responses will greatly suprise us. How much of the pollen and chemicals plants emit are actually for breeding? A lot is probably communicating environmental conditions and manage resources. As plants need less water, more will made availible for other plants. Can plants signal coming humid air for manage rain/clouds? Will it slow the movement of water across land and back to the ocean? Increase rain frequency? The article suggest that as the land greens, we should see less run off too. I expect this to improve with warming. No, The Maunder Minimum is not going to cause the next Little Ice Age. The Maunder Minimum happened during a cold time and got credit. The same kind of Minimum happens during warm times and don’t get credit. These sun cycles are happening in cold and warm times and do not cause them. They likely have some influence, but they are not the right frequency and they are not long enough. The Climate Scientists, on the different sides, find correlations with Sun Cycles, Orbit Cycles, CO2 cycles and whatever else. These many correlations do match sometimes and do not match other times. More ice extent during cold times and less ice extent during warm times does always correlate with temperature. ALWAYS! The temperatures are bounded because the temperature that Polar Oceans freeze and thaw is always the same and the more snowfall is always turned on in warm times and always turned off in cold times. There is no other factor that influences temperature that has a fixed set point for the thermostats. The Little Ice Age was caused by ice that advanced after hundreds of years of more snowfall during the Medieval Warm Period. Ice Advance occurs AFTER the more snowfall. The cold occurs during the more ice extent. The changes in the energy from the sun are small. The influence of Albedo is huge. It only takes a 2% increase in Albedo to change a Medieval Warm Period into a Little Ice Age. There was more ice extent during the Little Ice Age than there was during the Medieval Warm Period. If it got cold first, the source for the more snow would have been frozen. Yes, a Little Ice Age is on the way, but it will be after a few hundred years of the more snowfall that has already started. 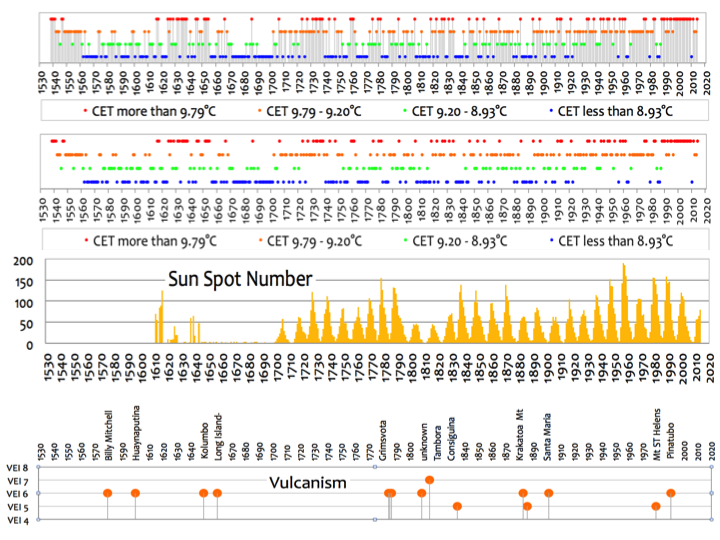 Nonsense, the coldest periods in CET are all during solar minima. Broader Impacts Statements: Are researchers thinking broadly enough? “What is the NSF Broader Impacts Criterion is, and why do researchers need to know about it? Intrinsic to their funding proposal process, the National Science Foundation requires that Principal Investigators (PIs), the person primarily responsible for the research project, not only defend the technical merits of their research but also address the project’s larger scientific and societal value under the Broader Impacts Criterion (BIC). Grant proposal guidelines now stipulate that proposals must address separately each merit review criteria in their project description or risk having their proposal returned without review (NSF, 2013). I have a big problem with using American taxpayer money, via the NSF, to engage in politically correct social engineering and discriminatory affirmative action policies. The people of the USA do not support these kinds of policies – even looney carbon tax California passed, by a wide margin, a ballot initiative to end these policies, though the University of California has largely ignored it. In particular, there are more women than men attending college, and women are capable of competing on their own. I live near a UC campus and my kids went to school with many children of female professors, grad students, and post docs in the sciences. Conversely, there are a lot of unemployed OWGs in the STEM fields and Asians are routinely discriminated against in college admissions. Apparently, the administrators at college campuses and the NSF can do whatever they want. The NSF policy is not even consistent with their own de facto mission statement as stated ( see above) on their about page. I’ll bet most people in the USA would be outraged if they knew about this. It turns out bad ideas can persist in science for decades, and surrounded by myrmidons of furious defenders they can turn into intolerant dogmas. . . .
Lysenkoism, a pseudo-biological theory that plants (and people) could be trained to change their heritable natures, helped starve millions and yet persisted for decades in the Soviet Union, reaching its zenith under Nikita Khrushchev. . . .
they had political support, which enabled them to monopolise debate. . . . The “bad idea” in this case is not that climate changes, nor that human beings influence climate change; but that the impending change is sufficiently dangerous to require urgent policy responses. . . .
the organisations that did the most exaggeration trousered the most money. In the case of climate, the alarm is always in the distant future, so can never be debunked. These huge green multinationals, with budgets in the hundreds of millions of dollars, have now systematically infiltrated science, as well as industry and media, with the result that many high-profile climate scientists and the journalists who cover them have become one-sided cheerleaders for alarm, . . .
Michael Oppenheimer, . . .who frequently testifies before Congress in favour of urgent action on climate change, was the Environmental Defense Fund’s senior scientist for nineteen years and continues to advise it. The EDF has assets of $209 million and since 2008 has had over $540 million from charitable foundations, . . .How likely is it that they or Oppenheimer would turn around and say global warming is not likely to be dangerous? one good thing that has happened to science as a result of the climate debate: the democratisation of science by sceptic bloggers. . . . Following Steven McIntyre on tree rings, Anthony Watts or Paul Homewood on temperature records, Judith Curry on uncertainty, Willis Eschenbach on clouds or ice cores, or Andrew Montford on media coverage has been one of the delights of recent years for those interested in science. Science will need a reformation. Has Matt Ridley ever objectively written about the historical record of Organizations that have consistently opposed regulations on things like: Lead & MTBE (gasoline), Mercury, Smog, Air Particulates, Acid Rain, Ozone Depletion, Methane, Coal Ash? Has Matt Ridley ever objectively written about the incorrect historical Catastrophic Economic Messaging by many conservative Organizations and Industrials on so many proposed or enacted Regs? Why should I trust Mr. Ridley any more than the also biased Dr. Oppenheimer? Perhaps he hasn’t written about the incorrect messaging because it is not, as you seem to suggest, simply bad vs good. As an engineer at Ford in the 70s, i discovered first hand that the EPA can start with a worthwhile goal and end with stupid regulations. Red herring ad hominem fallacy. Address the serious problems that Matt Ridley raises that are obvious to any scientist and engineering seriously examining them. Why are you advocating the corruption of science rather than reforming it back to a search for the truth with verification and validation of predictions against objective data? Making policy on climate models predictions that are running 500% hotter than reality since 1979 is beyond belief or understanding. Why do you support and enable such corruption? David Hagen — Obviously, I don’t agree with how most people here at CE “frame” and construct “straw-men” arguments. In your (and others) World, the opinion of a Nobel Prize winning Scientist like Dr. Molina (and others like him) would always be a Red Herring. The Nobel Prize has recently been devalued by a series of poor choices IMO and to use this as a form of appeal to authority does not have very much credence. Peter Davies — And what are (in your expert opinion) some of the poor Nobel Prize choices in SCIENCE? I could be wrong, but apart from a category called “Economic Sciences”, I can’t see any Nobel Laureates awarded for “Science”. I guess his might be to prevent awards for things like “Climate Science”, although some might say “Economic Science” is a contradiction in terms. Sorry about the typos, formatting errors, and writing “laureates” for “prizes”. Fat finger syndrome. I realise your question wasn’t directed to me, but I couldn’t help commenting. SS asks me to be more specific regarding my “expert” opinion on the choices for Nobel Prizes in Science. This seems not to be an invitation to engage in any form of productive debate so I will respond, but without any expectation that SS will be willing to look at his question in a more objective manner than in the rather snide way that he worded his question. I will say, however, that there have been some Nobel Awards given to scientists who have been just doing their jobs in a well tenured and supportive environment and that, IM(inexpert)O, not many awards in the field of medicine have matched in the relative importance of the work that resulted in the award given to Crick and Watson for their work on the human genome. As for the various Peace Prizes, the rot started with Gore, and the IPCC, OBama, and other Government agencies and I do not think that many readers will disagree that these awards are more politically based rather than on actual merit. I invited readers to look down the list of Nobel Prize awards for themselves and assess whether they believe that the relative scope and importance of some of the latter awards have not been as significant as in the past? I have been thinking of this question quite a lot over the past 15 years or so. Peter Davies — As I knew (that’s why I posted), you have nothing to back up your statement on “poor choices” of Nobel Prizes in Science (as Dr. Molina received). I’d like for just one Scientist here at CE to say they would turn down a Nobel Prize in their respective “hard science” field because the Prize just doesn’t mean much anymore. The reason why I post this is that you (and others like your) are disrespectful to Scientists who just don’t share your views on AGW. Dr. Molina believes he is absolutely following the science. Perhaps the Red Hering is the use of “Nobel Prize”. Presented as if the prize winner holds an opinion that cannot be disputed. In physics I have a strong bias that the fundamental work done in the first few decades (rough time-frame) of the twentieth century stands apart from that which follows. However, if one starts to consider the impact some work has had on society, the human condition or whatever–as opposed to the impact on science itself–the picture will look different. I imagine there are yet other metrics for assessing the relative merits of selections. BTW I do not confuse your question with questioning recent selections simple because I am not familiar with the selection criteria. Regards. richardswarthout — The issue here isn’t disagreement in science. Its disrespect. Disagree with scientists like Dr. Molina all you want on the science. To make judgments that scientists like Dr. Molina are predicating their science opinions based on “hijacking science to a liberal agenda” or that Dr. Molina just refuses to look at data the way you think it should be looked at (when he won a Nobel Prize) is — disrespectful. Perhaps the Red Hering is the use of “Nobel Prize”. Presented as if the prize winner holds an opinion that cannot be disputed, or who’s methods are, merely because of the prize, beyond reproach. I am not a fan of disrespecting anybody (disrespecting a body is ok, but not an anybody). However, a noble prize does not entitle the recipient to respect. If he/she becomes ruled by bias, then criticism of the person can be acceptable, though perhaps not advisable. SS did not address the points that I made about Nobel prizes, preferring instead to call me “disrespectful” of science. No engagement, no time for considering my POV or the POV of any other “denier”. I call this type of behaviour as complete and utter disingenuousness, not worth the time of my day. mwg I understand that the criteria for Nobel selection may not be apparent to the lay observer but I reiterate that some (not all) of the later awards appear to me to be of relatively minor achievements compared to that of previous awards made prior to the year 2000. A point that SS steadfastly refuses to address. As I look at physics I strongly feel the same way. I just see opportunity for debate centered around selection criteria. For the record I do not not see your comments as disrespectful. For the most recent ten thousand years, the warming has stopped at about this level or just a little higher. We have a new normal. popesclimatetheroy this is for you especially where x+x does not equal a given x climate outcome. This is why sometimes the climate changes are major when solar activity changes while at other times they are moderate or minor. Given my reasoning below and my check list for items that may influence the direction of the climate if the climate does not cool going forward I will reconsider all of my positions. First my check off list for the climate trend going forward. Solar Variability – favorable for strong cooling and increasing as the maximum of solar cycle 24 comes to an end. Geo Magnetic Field – in a weakening mode which should enhance solar effects and contribute to a cooling trend. Milankovitch Cycles- in contrast to 8000 years ago more favorable for cooling. N.H. summers now corresponding to aphelion. Land/Ocean Arrangements- very favorable for cooling. PDO/AMO/ENSO phase going forward should feature the cold phase with more La Nina’s. Finally the secondary effects associated with very low solar activity from an increase in geological activity, to a more meridional atmospheric circulation to more clouds as some examples will favor cooling. Let me try to approach it in this manner. The shortfall when it comes to climate is many are unable to intergrade all the various factors that are involved when it comes to the climate that will not result in a given item (the sun) changing in a given way resulting in an x climate outcome. Somehow this opinion prevails that an x change in solar variability has to immediately translate to an x change climatic response. In addition lag times need to be incorporated into the equation of the climate. I will add, climate regime change, and natural variation of the climate within a climatic regime are entirely two different things. What throws many off is the natural climatic variations within a particular climatic regime. This is what obscures the solar climate connection. In addition I will go so far to say the climate can not change into another climatic regime without the aid of solar variability but that does not mean it can not fluctuate within a given climate regime. Here are the four factors (Milankovitch Cycles, Solar Variability ,Geo Magnetic Field Strength ,Land/Ocean Arrangements/Ice Dynamic ) which govern the climate of the earth and give it a beat of 1500 years or so but never in an exact regular cycle. This explains why the 1470 year climate cycle is there but it varies so much over time. Further I maintain that all Intrinsic Earth Bound climatic factors are limited as to how much they can change the climate due to the total amount of energy in the climatic system they have to work with. Hence, they have the ability to change the climate within a climate regime( maybe plus or minus 1c) but they can not bring the climate from one regime to another regime. They refine the climate. Then finally the rogue asteroid impact or maybe super nova explosion some where off in space that at times had a big impact on the climate system which would further obscure or even eliminate at times the 1500 year semi cyclic climatic cycle. I read what you wrote. I will read it a couple more times. Some of the stuff you wrote does make some sense to me. Some don’t. There is little heat exchange between the north and the south. That means there is enough to keep them in sync, but they must both have their own thermostat set point and robust forcing. Let me add ice dynamic/Southern Ocean dynamic has to be watched. So, the Guardian – who would know – is dishing out lessons on how to schmooze and manipulate. It left out the main lesson: Build your case on slob terminology like ‘climate change’ and ‘global warming’. Tricksters! Always start with loose, ill-defined but highly loaded terms! Be specific – but be specific about pure mush which can change its meaning in a blink! Now go forth and proselytise to the worried, the conceited, the posh and the inner-urban. Your words will be like Fair Trade organic honey unto them. Odd that they talk about rises no later than 116,000 years ago. You might forget that Bass Strait filled with water a mere ten thousand years back. And you might forget that to re-stage the Claudian invasion of England of a mere two thousand years ago you would now have to drag your ships a long way inland. I really think our professional “communicators” are better off doing what Slate does: talk about stuff that hasn’t happened yet and treat the indicators of a strong El Nino as the build up to a football final. Those Slate boys do everything for the excitement, short of selling the popcorn. The other thing about the Eemian Sea level that the paper did not go into was the rate of change.. Other papers cover it well. First rise above present SL to maybe six meters higher took about 3000 years. 2mm/year. At a temp estimated 3C higher than now globally, and which Greenland ice cores sighestbwas up tom8C higher there than now. We are presently at 1.8 (ignoring the GIS correction, just actual observation). No problemo. The rate argues for adaptation only. Only the so far nonexistant acceration of SLR could questionably create a problem in a century or two. But it would have to be one humongous acceleration. Simply not credible on historic evidence. That is why warmunists worry about collapsing ice shelves, for which there is no credible historical evidence at all (guest post and essay By Land or by Sea). > The rate argues for adaptation only. To what that “that” refers is unclear. “Warmunists” provides a connotation that the CAGW meme does not have. “The rate argues for adaptation only. Rud, I thought you used the word “argues” figuratively. Can’t imagine why that’s a prob. Still, when all people have is gotcha, they are bound to go gotcha an awful lot. Navel gazers are often inveterate nitpickers. When they are not busy moderating a warmist echo chamber blog that no one visits. rates argue is figurative.. U know a metaphor. It basically hides who is making the argument. Rud believes the rates are evidence supporting HIS argument. But the metaphorical language makes it appear as if the thing speaks for itself. they dont speak. Rud argues. Whose name is on the comment? Naughty Rud! Making us think the rate was arguing while it was Rud all along! Well, it does to me. But making it explicit is a quick, shorthand way of communicating his opinion. I doubt any reader who’s survived the last 50 years of TV advertising will be fooled. Willard, four things are evident from your nitpicking comment. 1. Unfamiliarity with legalese. The construct is quite common, even in Supreme Court briefs. “these facts argue for” is shorthand for ‘Judge, these facts mean you should agree with my arguement that…’ 2. Nothing of substance to contribute about the historical facts of SLR rates during interglacials like the Eemian. 3. For a blog comment written on iPad, the ‘that’ reference seems to have been clear enough to most except you. SLR acceleration through melting is nothing alarming. So to get alarming, ice shelf collapse has been postulated. That refers to the first statement, so Read guest post/ essay By Land or By Sea for a takedown of the two main peer reviewed papers claiming to have found same. 4. You have apparently not read Vaclav Klaus’ (former head of Checkoslovakia) book Blue Planet in Green Chains. AFAIK that book first drew the analogies between climate science and Lysenkoism, between green methods (Greenpeace…) and the communist methods he lived under. Hence warmunism and warmunists. I rather liked his analogies, and IMO they grow clearer and stronger with time. Wrote about his book and his conclusions briefly at the end of an essay illustrating inappropriate CAGW tactics and messaging in my last ebook. You know, stuff like skeptics and deniers are criminals/criminally insane/flat earthers… Or Sci Am and Mann calling Judith a heretic and anti-science. All documented with footnotes. A high sink rate near the ground argues for immediate full power. Do I listen? He clearly exposes the agenda behind the rhetoric, based on his hard won experience in throwing off communism. SLR acceleration through melting is nothing alarming. This proof by assertion begs the question as to what acceleration would be alarming to Sir Rud. AFAIK that book [Vaclav’s crap] first drew the analogies between climate science and Lysenkoism, between green methods (Greenpeace…) and the communist methods he lived under. Hence warmunism and warmunists. I rather liked his analogies, and IMO they grow clearer and stronger with time. Vaclav made Sir Rud do it, so it’s alright. Pingback: Nassim Taleb Strikes Again | Watts Up With That? “Keep calm and stop obsessing over weekly changes in ENSO” by Michelle L’Heureux at NOAA, 7 July 2015. Fear of ENSO is part of the general state of fear, of both weather and climate, that the alarmists have created, NOAA being a leader here. The NOAA NWS webpage that gives me my local weather forecast now also tells me where the worst, scariest weather in the country will be. That’s a powerful observation! How do we reconcile these two contrary threads of NOAA’s voice — alarmist and balanced? I have wondered if there are two groups in NOAA? One giving the public a dispassionate rational view of science, the other seeking to terrify the public. Quite possibly, Editor. Michelle L’Heureux is listed as a meteorologist and a lot of them are skeptical. See http://www.cpc.ncep.noaa.gov/information/personnel/. Mind you this is the “Climate Prediction Center” so she may be in the minority. NOAA’s chief alarmist is Tom (King) Karl, who heads the USGCRP steering committee and has long been trying to establish a National Climate Service in NOAA, along the lines of the National Weather Service. Natural variability? NOAA never heard of it. Karl vs. Nieves? Sure looks like two differing trains of thought. Sounds interesting, but what comment are you referring to? Poor shorthand on my part. Apologies. Disregard. Noaa vs. Nasa. My fumble. I am impressed that you admit it. IMO that puts you in the top tier of commenters. I thank you for your kind words! I agree, but was not referring to anything as specific as two recent studies. We were discussing NOAA’s frequent alarmism in descriptions of weather — my favorite: description of weather as “greatest in 5 years” — vs notices like above urging calm about extreme weather. There are many possible explanations, but there might be two “cultures” in NOAA. Alarmism that captures the public attention and propagates, and reason for the historical record. Speaking as someone whose written hundreds of news articles about the climate wars, replying to thousands of comments from activists on both sides — you’ve given the best epigram I’ve seen. Let’s hope it doesn’t become an epitaph for either us or the credibility of science. We have to avoid both Scylla and Charybdis. Is our certain fate a coal-burning climate apocalypse? Summary: The news media overflows with scary stories as we approach November’s United Nations Climate Change Conference in Paris. The latest are fears about the coal apocalypse, based on forecasts that the fuel of the 21st Century will that of the 19th C: coal. This is the basis for the IPCC’s projections. Like most aspects of climate modeling, these tales are often told with undeserved certainty — and omit mention of the contrary case (or that there is a contrary case). Thanks for providing that “back story” to the current activities of NOAA. Presumably in your list of linked articles is the report from the CIA in the early 1970’s which suggested setting up various bodies to prepare for the climatic change? How ironic (and a great story)! Thanks for this. I know of 3 relevant CIA reports from the 1970s, often conflated. The first one is of little interest (now) “A study of climatological research as it pertains to intelligence problems”, CIA, August 1974. The second is “Potential Implications of Trends in Population Growth, Food Production, and Climate”, August 1974. I have not found a copy. The third was about climate change, released May 3, 1976 amidst a flurry of newspaper articles passing on leaks from officials saying it predicted some sort of cooling. I’ve never found its title, let alone its text. More broadly, the CIA and DoD are trend-followers, always riding the current hot topic in search of attention and funds. The authors are seldom experts in the field, and typically retail a biased sample of actual experts’ opinions. Structurally they’re like the recent words from the Pope about climate change (from a non-Catholic perspective). They’re fun headlines, sometimes useful sources of information, but imo are not authoritative. They’re not in the same league as the official NOAA history as a guide to the history of science. Thanks for finding that! I’ll add the link. It’s typical CIA/DoD report: linear extrapolation of current trends. Forecasting by ruler. As so many insiders have said about the CIA, most of their reports tell you little that’s not in the New York Times. The sooner we can get used to the idea that arctic ice waxes and wanes the sooner we can have a sensible discussion about climate change and put the modern era into the context of past events. One of the great oddities in both the science and public debates about climate is the prominence given to short-term datasets, such as the post-1979 satellite data (more often, of course, in the public debate). “Record high!” Sounds more dramatic than 35-year record high. Even more misleading are “long-term” trends in northern hemisphere data given without mentioning that they often refer to periods dominated by the descent and recovery from the little ice age. It is the “recency” logical fallacy at work, one of the more dangerous ones. I had to check your comment about the New York times and sure enough on dec 29 1974 was confirmation of increasing ice! This can be traced back to a paper by Kukla and Kukla of that year cited by Lamb. If we can forget what happened to the climate in an era most of us here have lived through what chance is there of convincing warmists of historic warm and cold events that preceded our birth? The climate disaster narrative hasn’t worked. They have a really big problem. How do they scare us when the scarey things they tell us are not really happening? They say the models tell us the scarey things will happen, they are supposed to be happening already, but trust us, they will happen, someday. @Jo Nova. Take the test. Or better, you could call this 12 tools for brainwashing people to believe the alarmism so that they can better be frightened, controlled and taxed. Reminds me that you never see probabilities for things like the expected % of smokers who will develop lung cancer. I don’t smoke for many reasons, but I suspect if they shared data showing the risk is lower than common perceptions, they fear more people would smoke. I think people have the right to know real information relating to risks. My Doctor once told me to consider a potential side effect of a prescription medication. I tried to find out if the risk was closer to one in a million, one in a hundred, one in ten or 50/50. He just said I needed to be aware of the risk and thought that was sufficient. For some of us there is a big difference between 50\50 and one in a million, for others not so much. They tend to be as unclear as possible about whether the consensus is about AGW or CAGW. Having a clear and consistent message about the scientific consensus is important as it influences whether people see climate change as a problem that requires an urgent societal response. Problem is, it’s just not that urgent. And the clearer they are about the science, the clearer that becomes to their audience. No wonder they do so much arm-waving. That has to be a challenge. Probably complicated whenever the US President opens his mouth. Why? Natural causes or caused by global capitalism? the end of humor, a ban on James Thurber? The central India paper says land cover influences rain. With land cover changes, precipitation dropped. It seems plants can form their own precipitation pipe line. I started wondering about the 1930s droughts. Converting grassland to farmland might hinder this biotic pump. In southwestern Minnesota your going to pulverize the surface and bury any existing plants. You seed it and it spends a month or so with very little cover. Corn and wheat will get to where there’s some density for an evaporation conduit with soybeans less so. But it’s still significantly black dirt and no rich deep prairie turf. There is some depth of water storage with plant roots able to draw water up to evaporate. I suspect the biotic pump is hindered by farmland increasing droughts, but am not sure about that. What I do know is we are big on getting rid of water with drainage ditches with a lot of it ending up in the Minnesota River. A lot of it isn’t evaporated and ends up in the Gulf. The idea is any standing water in my field is bad. But it’s good for local precipitation. Natural drainage is considered bad as beavers build dams and flood lowlands. That keeps the water where it’s needed. It is preferred to build straight deep ditches. So perhaps farmers contribute to droughts with their practices and it’s not just ocean cycles. As with natural variability of Earth’s weather and climate, the solar cycle and its variability is not internal, but is ordered by the planets. This minimum will be short like the last two (Dalton and Gleissberg), and will be recovering in SC26, with the weakest part from late this year to 2024. So what we need is more astrology? I am pretty sure the sun has a lot of internal variability. I am finding inherently predictable laws to the planetary ordering of solar activity at a number of scales, down to the scale of near daily weather type variability. There is no “astro” in it apart from our Sun, which is why I call it Planetary Ordered Solar Theory to avoid confusing it with astrology. My answer to this is maybe? Many do not agree that the solar cycle is not internal. Time will tell. The situation is that at least since 1920 people have noted that sunspot cycles loosely follow Jupiter-Earth-Venus syzygies, but that says nothing about cycle amplitude, length, timing of sunspot maximum, and where solar (grand) minima occur and for how long. I have identified a linkage to other bodies that now shows where most sunspot cycle maxima occur within a year or less, and precisely which sunspot cycles are most weakened in each and every minimum. Or rather additional bodies to the former three. It’s not that confusing if you use CET and earlier written weather records, the coldest winters occur before the eruptions rather than afterwards. What about the warm AMO mode? EXCLUSIVE: Tony Abbott has been warned he is putting international investment at risk after ordering the $10 billion Clean Energy Finance Corporation not to finance new wind power projects. If they ever come to understand that the warm times with open polar oceans are the times that land ice is replenished and that the cold times with frozen polar oceans are the times that land ice is being removed, then they can fix the flawed climate theory and fix the flawed climate models. It snows more when oceans are warm and it snows less when oceans are cold. That does bound earth temperature. Earth came out of the last major ice age because snow accumulation was not enough to replace the ice that melted every year. Earth stopped the rapid warming, ten thousand years ago, because snow accumulation became enough to replace the ice that melted every year. Now, minor adjustments in albedo keep us bounded between warm periods such as the Roman, Medieval and Modern Warm periods and cold periods like the Little Ice Age. Look at the actual data. You say which is very similar to Robert Felix of iceagnow.com his web-site. I agree with you intrinsic earth changes needed to bring about climate changes bur I am of the opinion in addition players such as Milankovitch Cycles, Geo Magnetic Field Strength, Solar Variability, Land/Ocean Arrangements ,Ice Dynamic are vital when looking at the complete picture not to forget the random impacts from asteroids which must have played a part in a few of the dramatic climatic shifts ,maybe 5% of them? What do you feel the albedo value was during the height of ice ages? Curious . My understanding was it was around 34%. Taleb is clearly continuing his work where he previously showed that existing risk models could not possibly be accurate given the frequent and large errors output. Interglacials are much to be preferred vs glacial periods where glaciers flattened everything in their path down past Indianapolis IN. Must be true. Scientists have predicted it. The Royal Astronomical Society believes it. But are the authors “real scientists”? Are they members of the Esteemed and Most Distinguished Brotherhood of Climatologists? Is anybody? It might go to show that different scientists can make different predictions. Time will tell, no doubt. We can always find something to panic about before we die! This is meaningless unless you also specify what a ‘sufficient duration’ is. One day? One month? One year? one solar cycle? one century? For all those who worry about the impacts of climate change, check out this article in the New Yorker. Makes even worst case scenarios seem like a mild headache compared to tramatic amputation of the head. So, which potential threat should the US be more concerned with – i.e. which one should we be allocating dollars to? EGU’s Ocean Science journal has new paper on the failure of models to properly represent the processes responsible for Atlantic Ocean heat transport into the arctic and its implication for future projections. From what I understand they identify a complete lack of modelling of key process that leds to bias and under estimation of variability in model output. Seems quite damn and strongly worded to me. An engineerable system. That’s the climate. That’s the economy. They are machines, yet they give a pretty good imitation of life. My problem even with people like Greenspan was the cartoonish idea there is one or perhaps two variables to control things. To steer and economy. That would mean we elect the President who appoints a really smart economy steerer. Likewise that is the climate science answer. One variable.